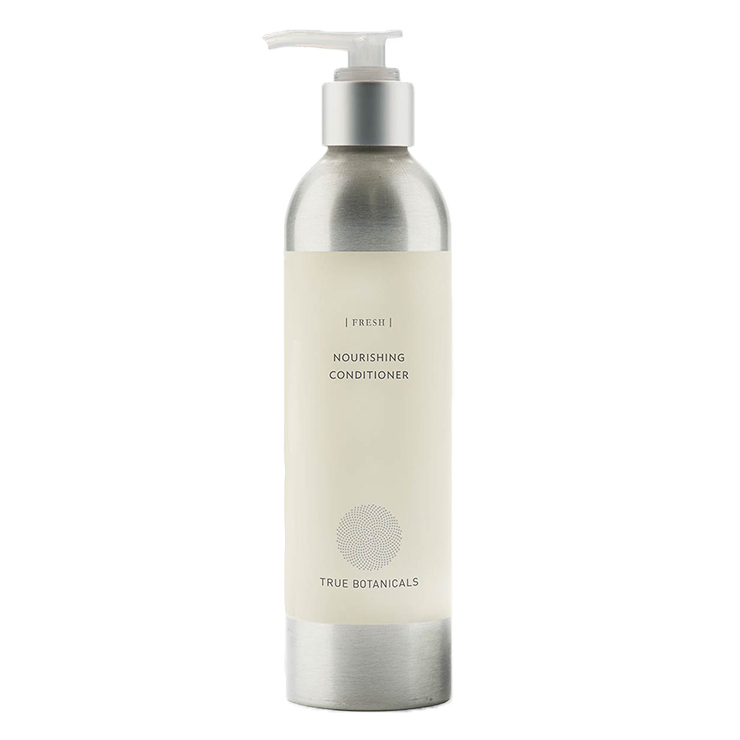 Attain rich, vibrant, healthy looking hair with True Botanicals Nourishing Conditioner. Coconut and green tea oils are moisturizing and antioxidant rich, offering a sense of protection from damaging UV rays. Shea butter and macadamia oil further the feeling of intense hydration, while panthenol makes hair feel ultra soft and improves the feeling of elasticity. Biotin provides a sensation of nourishment to hair and sage improves the feeling of hair volume. Formulated for normal, dry, damaged, and color treated hair types. Massage onto scalp and hair after cleansing, and leave on for 1-2 minutes. Rinse with warm water. Camellia Sinensis (Green Tea) Extract*, Cetearyl Alcohol (From Coconut Or Sustainable Palm), Water, True Botanicals Fresh Scent** [Citrus Limon (Lemon) Peel Oil, Citrus Aurantium Dulcis (Orange) Peel Oil, Cananga Odorata (Ylang Ylang) Flower Oil, Viola Odorata (Sweet Violet) Flower/Leaf Extract, Mimosa Tenuiflora Bark Extract], Cetrimonium Chloride, Butyrospermum Parkii (Shea Butter), Cocos Nucifera (Coconut) Oil, Camellia Oleifera (Tea) Seed Oil*, Macadamia Ternifolia Seed Oil, Panthenol, Gluconolactone, Biotin, Dimethyl Sulfone, Aloe Barbadensis (Aloe Vera) Leaf Juice Powder*, Tocopherol (Non-GMO Vitamin E), Rosmarinus Officinalis Leaf Extract, Salvia Officinalis (Sage) Leaf Extract, Equisetum Arvense Extract, Phenethyl Alcohol***, Ethylhexylglycerin***. The packaging, the scent, and the texture...all a win. My hair just didn't agree with the results. I used the shampoo, then used the conditioner. With my fine, dry, long hair, I found that it left my hair tangled and dry. I have since doubled up on how much I use, but don't see an improvement. This just isn't a fit for my hair. As I stated on my shampoo review, I was skeptical that "nourishing" would mean "greasy buildup." Not so. The conditioner has a nicer scent than the shampoo and has a lovely thick texture. The result is that my long hair looks very full and shiny and bouncy. I really like this. Lovely conditionner, amazing smell, works super well with the shampoo. I love True Botanicals products!